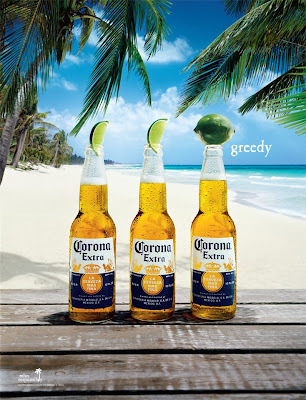 Corona do strong outdoor advertising. By consistently using relaxing beach scenes and the lime, I'm told they get comparably higher recall than many competitors despite lower budgets. This ad follows most of the good outdoor principles: Simple message. Strong branding. One visual - while strictly it is not a single image (3 bottles, not one), it is probably fair to say they form one visual, as they are grouped together. Short headline. And humour. Try and give the ad more blue sky. To do this, I'd either cut back on some of the tree leaves or cut back on the excessive space given to the wood table at the bottom of the image and pull everything down a bit. This would allow for more blue sky. With more blue sky available, I'd make the "greedy" headline bigger. And I'd see if I could get more contrast between the white headline font and the light blue sky behind it. Perhaps a slightly darker blue around the headline. They are minor changes though. It's a good ad. Paul, do you know why they put lime in it? I am not sure if this is 100% true or not but I was told that it is a tradition from when the bottling process wasn’t as clean. They used to rub lime around the top to use the acid to sanitize the mouth of the bottle and then used to just pop the lime in the beer. hi Daniel, I had heard something similar too. Again, not sure if it is true. They certainly use it well now anyway.